I love libraries. But I will openly admit that I don't hang out at our local library that often because it's small, has limited comfortable seating and really is more of a checkout location than an inviting community space. Yet there are so many incredible ways to hack our libraries and make them much. more. awesome. Thankfully, there are many communities (even mine!) 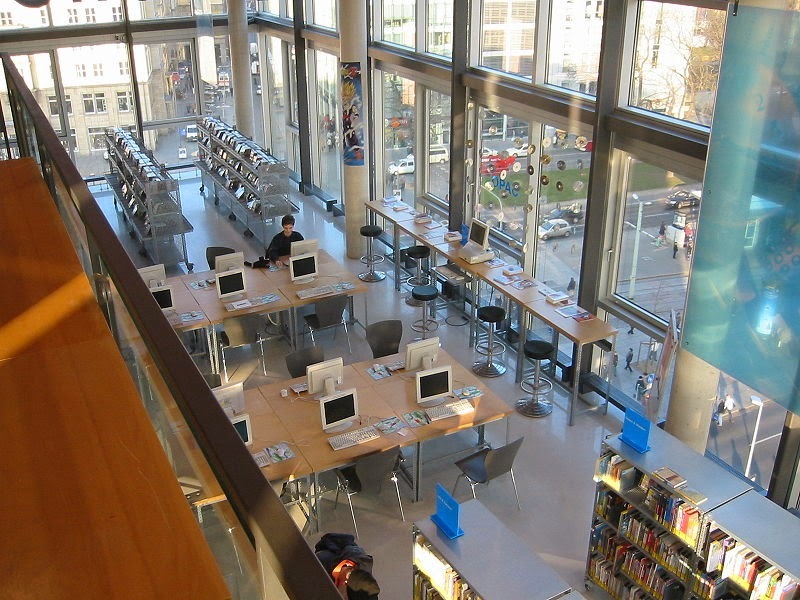 that are starting to rethink how libraries can become more communal spaces. Instead of merely serving as book repositories, they are transforming themselves in to spaces for community events and learning. Now, that might not sound like a stretch considering libraries generally have community rooms or meeting spaces available for groups to meet or hold small events. But that's not what I'm talking about. I'm talking about radical library reinvention. Libraries are offering physical space to DIY groups for 3D printing and general making experiences. In Ottawa, the group Young Maker is traveling between libraries and community centres to bring 3D printing to underprivileged youth. Their goal is to expose 3D printing technology to kids who might not otherwise get a chance to learn about it, let alone try it out and perhaps open up the world of Science, Tech, Engineering and Math (STEM) to kids who might otherwise not consider them as options for their futures. Wouldn't it be fantastic if maker spaces were a standard installation in all of our libraries? And how about teaching them about space? It costs very little to set up a spare computer with Stellarium, an open source astronomy program that lets users explore the depths of space and even contribute back to the community with their own findings. So many learning opportunities: space, open source community, hacking and classification... the list goes on and on. Stellarium is so good that it's even used in Planetariums; so why not a community library? And because it's open source, it doesn't need expensive updates so there is little to no impact on the library's budget. So much win. What if it was an open source loving, hackfest hosting community centre? Maybe it has a ton of computers that were once used for looking up physical copies of books, but with e-readers and digital media taking over, they lie dormant most days. So what it they were offered up as web terminals for hackfests. The library could line up extra sets of tables and chairs where hackers and non-hackers can come together to talk about their open data needs and brainstorm app ideas using the City's data. Your data. Maybe they could even host hackathons for Little Geeks, encouraging them to think about data and how it can improve not only their lives but that of those around them. Maybe our libraries rekindle their role as the heart of the community; a gathering place for people and the birthplace for new ideas. As countries assert the right to access broadband Internet as a human right, the role of the library in delivering that access will become increasingly important. The decrees require humans to have access, not necessarily the requisite devices. If I, as a person, am entitled to broadband Internet there must be a mechanism by which I can access it. And if I can't afford it, then I need to be provided a means by which to access it. The library is the most obvious choice: My residential status in a town provides me with guaranteed access to my local library which in turn guarantees me broadband Internet. Another fantastic argument for the continued existence and relevance of libraries in our communities. And a no-brainer, really. Libraries catalogue and store seeds for various crops. People check them out and plant them and bring back new seeds. This assures that the most robust crops from the region are carried forward in the collection. With open data, the cataloguing could be performed by the global community, helping under-resourced libraries keep up with demand. The result could be a global open seed network complete with APIs for data sharing, which would be incredible in the event of natural disasters. Pretty amazing stuff, don't you think?! I know, libraries are already media providers since they stock books and movies and music and... But what about this: The British Library Flickr account has over 1Million images that are rights-free. They are curating and sharing them with the entire Internet. This is notable since, usually, media is only accessible to the citizens who reside within the library's jurisdiction; but with an online presence, that audience has the potential to be global. Of course, it can be difficult with certain types of media: e-books are known to cost significantly more than hard copies, for example, which is why libraries tend to have limited copies in the e-catalogues. In this case, the British Library got the images from Microsoft who had digitized them from books dating back to the 17-19th centuries. So any rights over the images have long-since expired. And although there is a chance that you might be able to find them elsewhere, the library's Flickr collection has the added bonus of data: the library has been cataloguing the images and adding metadata to make them searchable and findable. In fact, they've even requested assistance in cataloguing, sorting and searching the photos in order to make them easier to navigate. Crowdsourcing their own cataloguing work on GitHub and using open data. Absolutely ground-breaking. Dog, I love librarians.